In a large bowl or bowl of a stand mixer, mix cake mix, water, oil and eggs on low speed 30 seconds, then medium speed 2 minutes, scraping bowl occasionally. Divide batter between 2 bowls. Dye one bowl with blue food coloring and the other bowl with green food coloring. Alternately spoon dollops of blue and green food coloring in lined muffin cups until about 2/3 full. Bake 18 to 23 minutes until a toothpick inserted in the center comes out clean. Use a serrated knife to slice off the tops of the cupcakes. Use a small paring knife to cut out a shallow heart shape in the center of each cupcake; scoop out the cake to make a 1/4 to 1/2-inch deep heart shape. Fill with red decorating gel. Replace cupcake tops, then pipe on frosting. 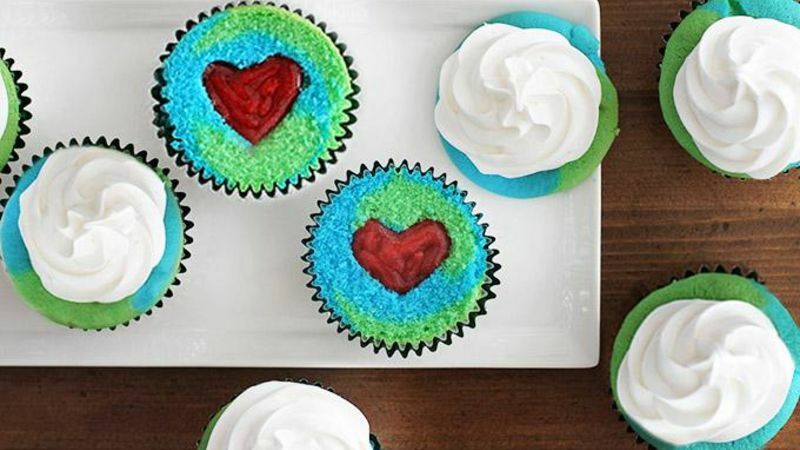 Bake these Earth Day Reveal Cupcakes and show your love on Earth Day (or any day)! These little cuties – a.k.a., surprise-inside cupcakes – look like edible globes of sweet deliciousness with a sugary heart hiding in the center. They're inspired by Bird On a Cake’s creation, and we thought they were perfect for Earth Day. Make them for an Earth Day party (is that a thing?) or just because you really want to eat some cute cupcakes. It’s all valid. First, round up your ingredients. I used Betty Crocker™ Super Moist™ white cake mix and Whipped Fluffy White Frosting because they're easy to use and work so well with this recipe. You’ll also need blue and green food coloring and red decorating gel (I got the sparkly kind! OoOOoooOooo). Prepare the cake batter, then divide it between two bowls. Dye one bowl with blue food coloring and the other with green food coloring. I use gel food coloring because it seems to dye batter better and doesn’t water it down too much, but use whatever you have. Alternately spoon blue and green colored batter into lined muffin cups (so they’ll look like globes when they’re baked, get it?). Bake the cupcakes until a toothpick inserted in the center comes out clean. Cool the cupcakes completely on a cooling rack before decorating. Now the fun part (as if you’re not having a grand ole time already)! Use a serrated knife to carefully slice off the top of each cupcake. Then, using a paring knife, cut out a shallow heart shape in the center of each cupcake. Fill with the red decorating gel so you have one sweet heart in each cupcake. Replace the tops of the cupcakes, then pipe on the white frosting. And that’s it! Be sure to share with someone you love.